Things have been a little quiet on the blog the past few weeks. I have taken a bit of a break from blogging over the holidays (a side from drinks over on Instagram) and was relaxing a bit, reflecting, and getting things in order for the new year. But I am baaaaack. 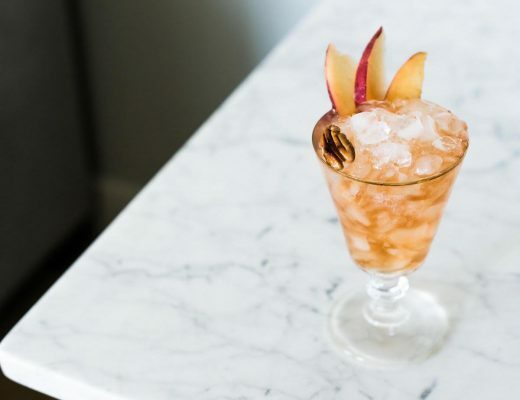 We all need a little extra vitamin C to give us a pep-in-our-step this time of year, and I am brining it to you today in the form of a delicious cocktail! The Winter Sun cocktail is just that, a dose of sunshine in your glass! And who can deny it with a color like that? 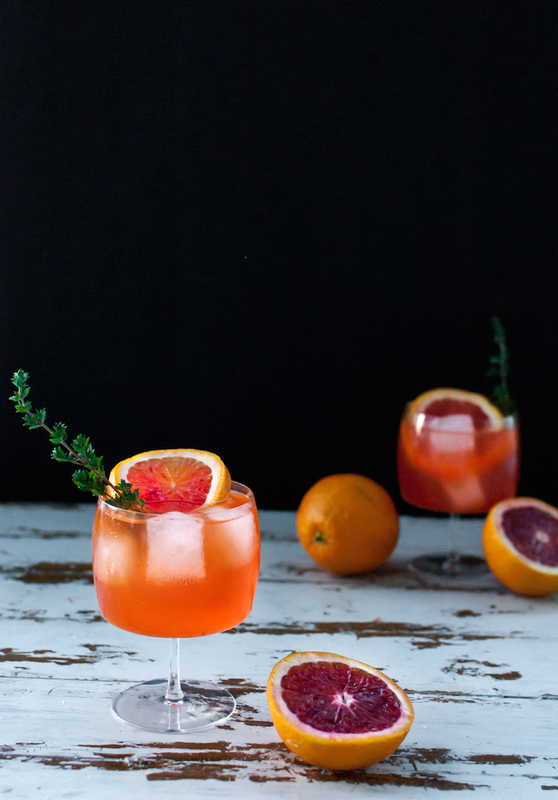 A mix of blood orange and Aperol give it a rich and intense orange hue that just begs to be sipped on. 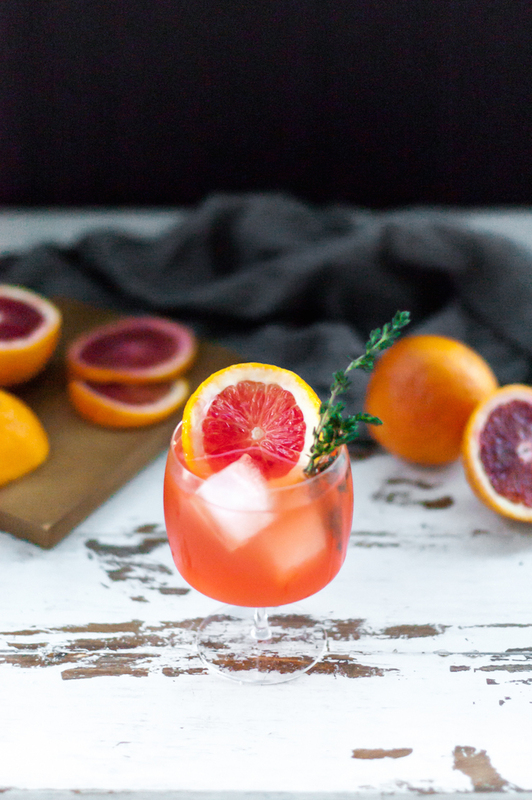 Get rid of that those mid-winter blues with a punch of orange! Blood oranges are in the peak of their season which means they are extra rip and juicy, yuuuum! There is just something about blood oranges that has captured the culinary and drink world by storm the past few years. Maybe it’s their unassuming exterior that gives way to the crimson flesh, or their sweet and slightly bitter flavor, but one thing is for sure, they are here to stay. They have a lower acidity then regular navel oranges so when using in place of oranges in recipes, adjust the blood orange accordingly to get the acidity correct. 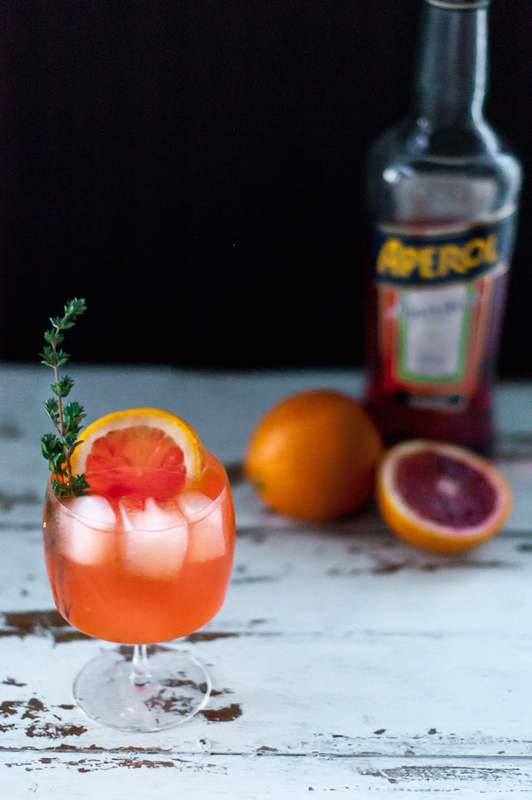 If you have never had Aperol before (not even an Aperol Spritz?) 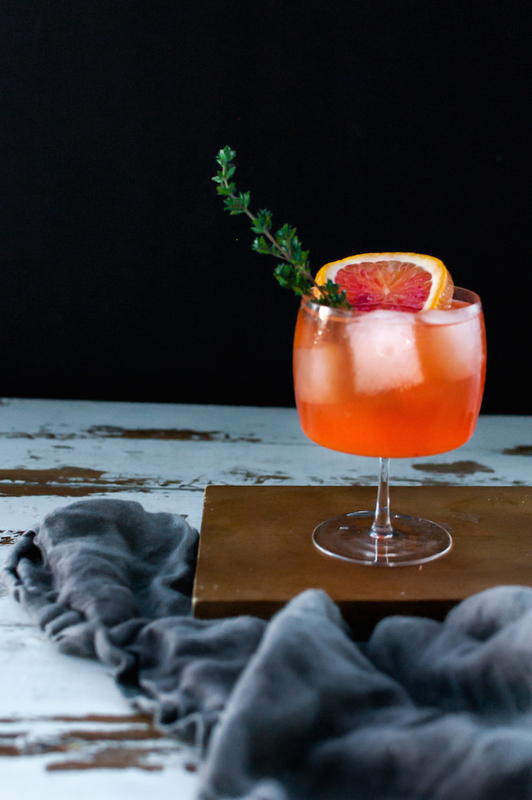 it is often compared to being Campari’s sweeter, orange packed sister. Despite it’s sweeter profile, It is still a bitter liqueur that adds a nice dry component to a drink. Comprised of bitter orange, gentian, rhubarb and cinchona to name a few, it’s flavor is complex as it is delicious. In the Winter Sun, it brings a nice, well, bitterness to a drink that would other wise be lacking in flavor and touch too sweet. 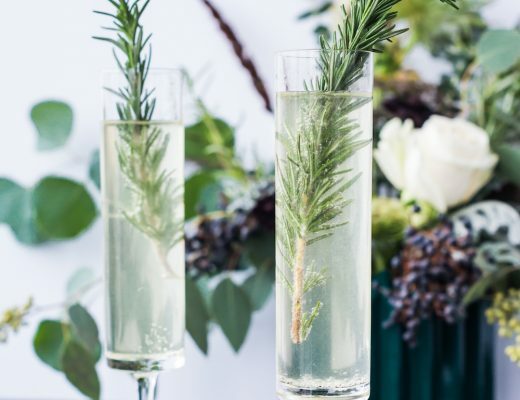 I love how herbs can perk up a drink, don’t you? 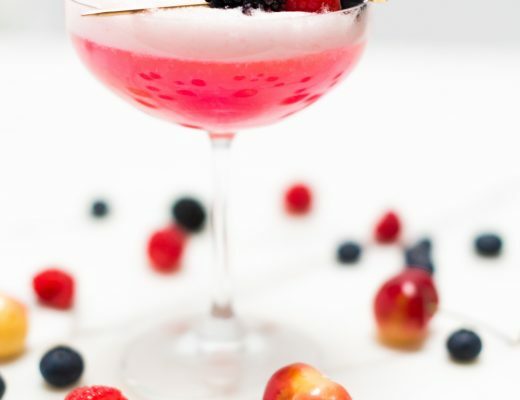 They bring a fresh flavor to a cocktail and as a garnish, they create another depth to the drink through their aroma alone. Plus, they just look dang pretty atop a tipple. Here I used thyme. It’s slighty earthy and herbacious that plays well with Aperol. 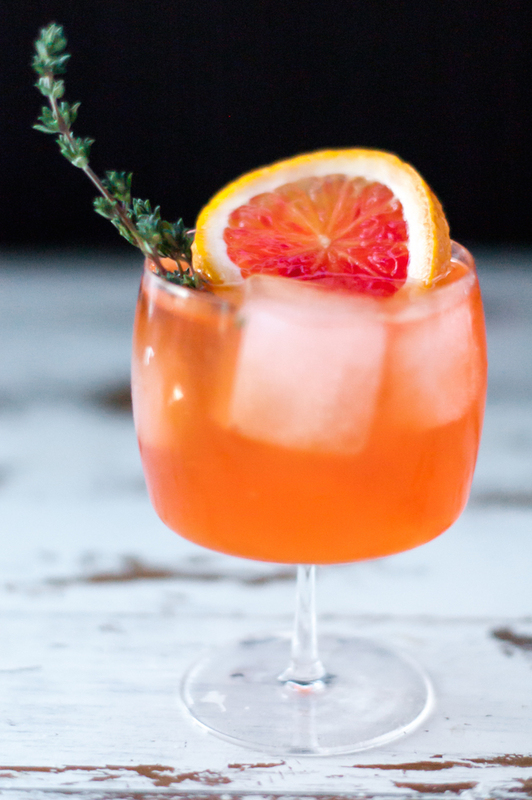 Orange and thyme just make a great combindation in drinks as well as in dishes and desserts. I can’t wait to make another round of these soon to chase those blues away! Combine all ingredients except for soda water into a shaker with ice. Shake and strain into a glass with ice. 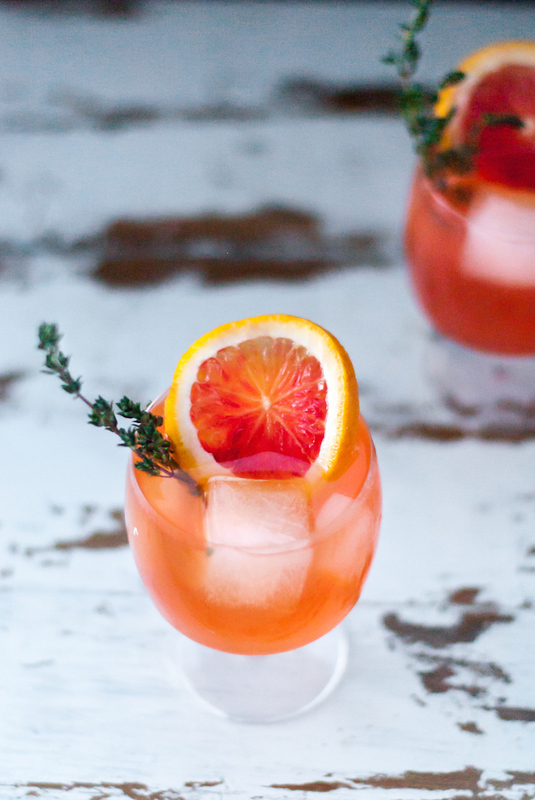 Garnish with blood orange wheel and thyme sprig. Place sugar and water in a saucepan on high. Allow the sugar to dissolve before adding the thyme sprigs. Bring to a boil and boil. Take off the heat and let cool, covered before using. If you love blood oranges as much as I do, be sure to check back during the season for even more recipes using these beauties. Trust me, there will be plenty of cocktails and even some food featuring this crimson citrus! 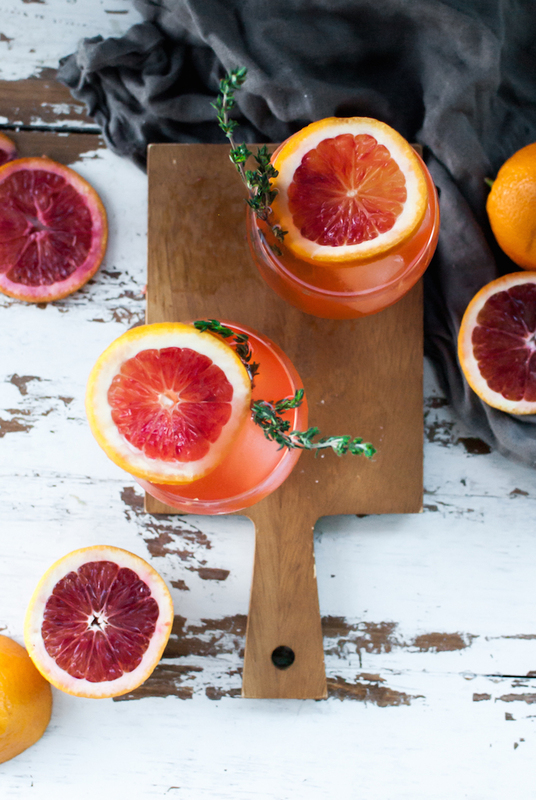 What is your favorite blood orange drink? I’d love to hear! Just discovered the amazingness that is blood oranges and they are the bomb.com! So glad you’re back! 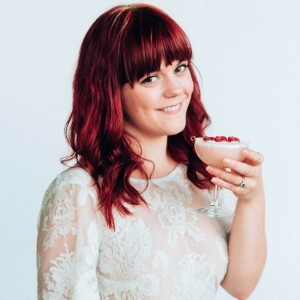 This is one of my favorite blogs and your drinks are always on point. They are sooo good, right?! So happy to hear 🙂 Rest assured, many more cocktails coming your way soon! 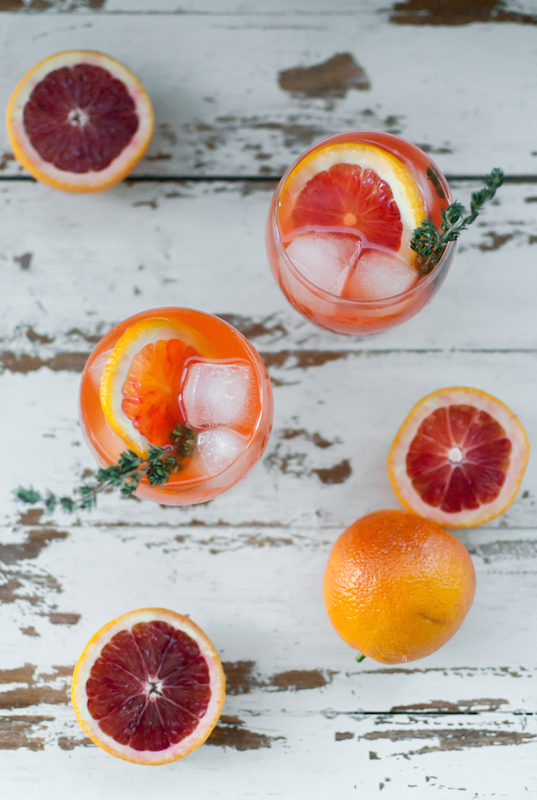 Blood oranges are soooo amazing I can’t stop using them in drinks! Thank you for such kind words, I love to hear that!